Shots have been fired, on Tuesday 03/15/2016 at about 15:00, at police during a counter-terrorism raid in the Belgian capital, Brussels. 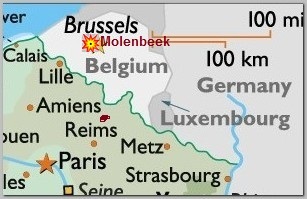 The incident took place in the southern suburb of Forest, close to Molenbeek, an official told Reuters news agency. Three Police officers had been lightly injured. Two men with Kalashnikov assault rifles opened fire on officers when they arrived at the suspected house . A prosecutor said the raid was linked to the Paris attacks which killed 130 people last November (2015). Belgian police have been trying to track down Islamic State militants involved in the gun and bomb attacks. * A major police operation is now under way in the area, with at least two suspects reportedly on the run. One of the suspects, yet unidentified, was shot dead by police at the scene from a police helicopter during the raid as he tried to flee through the backyard of the suspected house . The dead suspect is not one of the two fugitives still on the run. A fourth policewoman was also lightly wounded in the latest exchange of fire. The suspect was identified as an Algerian national and illegal immigrant , Mohammed Belkaid (pic-L), 36, officials said on Wednesday 03/16/2016. According to the prosecutor’s’ spokesman, an I.S.I.S flag was recovered from the apartment raided on Tuesday, along with Salafist literature and ammunition. ** One of the thought to be fugitives was arrested, on Tuesday 03/15/2016 night, while the other was detained earlier in the day, De Standaard newspaper said, citing judicial sources. Both were later release . According to the Belgian web journal Dernière Heure (The last hour ), the suspects are thought to be the brothers Khalid (l) and Ibrahim (R) El -Bakraoui , 27 & 30, known for gangster-related crimes and Islamic radicalization. Bothe committed a double suicide attack in Brussels’ Zaventem Airport on Tuesday 03/22/2016 . ** Fingerprints of Paris attack suspect Salah Abdesalam have been found in a Brussels flat raided this week, Belgian prosecutors said on Friday 03/18/2016. State broadcaster RTBF says he may have escaped during Tuesday’s police raid, in which one suspect was shot dead.